Do you have a landscape you return to in memory that revitalises you? A memoryscape where the sun is always shining, the air is sweet and fresh and the wonder of the natural world is all-encompassing? A few years ago a went on a tour from Adelaide to Perth across the Nullarbor Plains and on that trip I was infused with the magic of the Cape Le Grand National Park. It was a bit like entering the land of Oz for me. Many of the plants were cousins to those I knew well from the eastern states, but they were subtly or sometimes completely different, surprising me with their variations. The colours of flowers enticed me from amidst the greenery as we crossed the low shrubby coastal landscape on our walks. The silica sand there is so so white and glassy and pristine, and apart from the birdlife you can sometimes spot kangaroos hopping on the beach and nibbling the occasional fish. 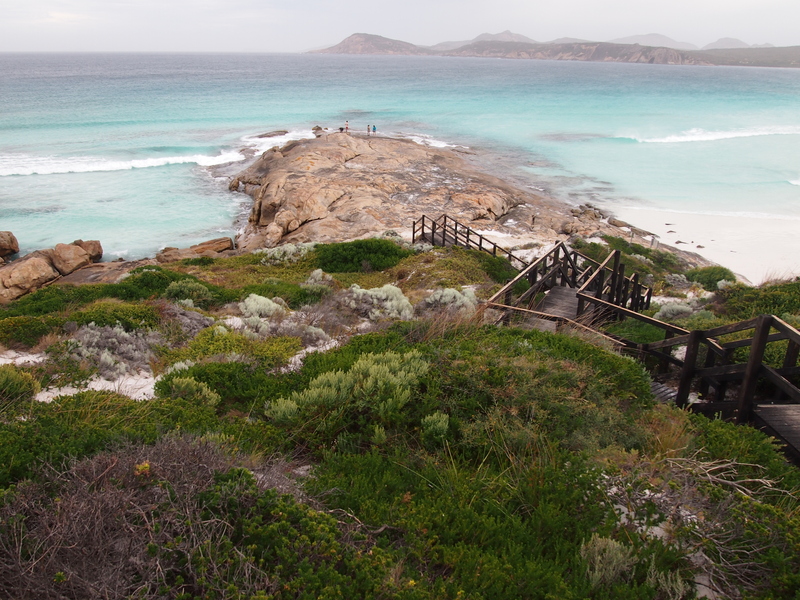 Pale granite rock platforms and boulders hug the coastline and the sea is truly azure. On a wet, cold day elsewhere in my mind i look out across the clear water at distant hazy coastal peaks and listen to the waves gently rolling in across the fine white sand. One day I’d love to return to those beautiful shores, but if I never get there, I’ll still see it in my mind.